Even though the picture makes it look like a melted mess, this sorbet was super yummy and cooling, making it the perfect refresher on a hot summer's day! If you were to prepare this like my Lemon Ice Cream (recipe: coming on Tuesday! ), you should end up with a proper creamy ice cream, but since this looks very... runny, i will call a sorbet. I should've added another frozen banana to this. Anyway - This recipe would also be perfect for popsicles! 3 large ripe bananas, frozen - i used 2 but recommend 3! 1 tsp agave syrup or preferred sweetener (optional) - i'm not using any! 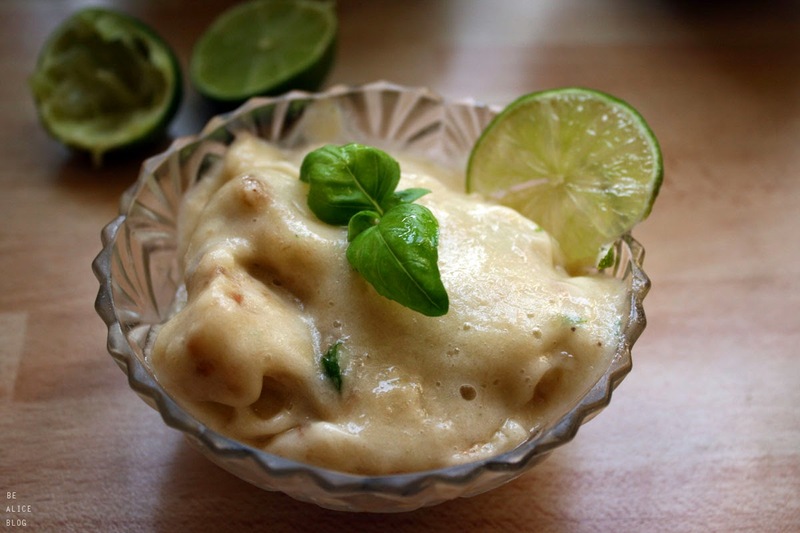 Okay, you know the drill: Place frozen banana pieces in your blending machine (high-speed blender, food processor or juicer), blend for a few seconds, add lime juice and basil, then keep blending until creamy smooth. You could also use the juice of 1/2 lemon instead of lime, but... well, it wouldn't be a Basil Lime Sorbet any more then, would it.